Biofilters for air pollution have proved somewhat successful in eliminating regulated emissions, but the persistent reliance on them is often based on the misinterpretation of design criteria not backed up by rigorous study. We see them everywhere—concrete pits built beside industrial or municipal facilities that look like big swimming pools but without the water. 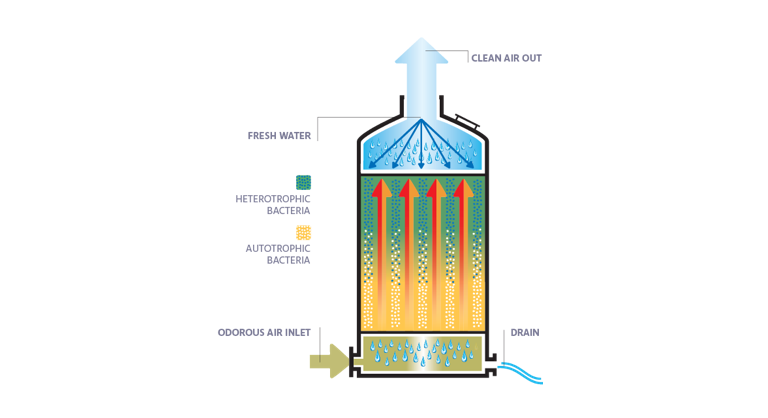 They’re biofilters, a rudimentary technology designed to remove pollutants and odors from air impacted by industrial and manufacturing processes. The method has been in use for decades. It works like this: A blower forces polluted air into ducting along the bottom of the pit. The air is then dispersed upward through a layer of porous rocks or gravel. From there, it travels further upward through a bed of some type of organic media—it could be grass clippings, peat moss, leaves, tree bark or any number of other organic materials. There, it encounters natural bacteria that feed on the compounds polluting the air. The result is cleaner air emitted into the environment. Do biofilters for air pollution work? The short answer is that biofilters sometimes do work well in some high-airflow / low-pollutant settings, but it’s more due to good luck than good engineering. The case for choosing the technology is usually made by highlighting a misused and inaccurate design criterion: Empty Bed Residence Time (EBRT). EBRT measures how long foul air is in contact with biological media before offending compounds are removed. When biofilters were first introduced, it was anecdotally recognized that a 60-second EBRT seemed to be enough time to effectively remove pollutants. But that’s never been systematically tested, even though municipal and industrial clients all over the world continue to choose biofilters to mitigate air pollution. What’s more, EBRT is an overly simplistic measurement that doesn’t account for the concentration of odor in the air or the surface area and other characteristics of the media through which foul air travels during treatment. It ignores the efficiency of the media, which is the part of the system actually cleaning the air. One size simply does not fit all when it comes to pollution or odor control. The 60-second EBRT value has persisted because it’s been convenient, not because anyone is sure of its efficacy. Another anecdotal claim is that biofilters are better suited for hydrophobic compound degradation. That claim has never been seriously scrutinized. Common biofilters for air pollution require constant replenishment —and regular replacement— of organic media. Depending on the type of organic media used, supplies of that media may not be reliably available. This could lead to inconsistent or unpredictable treatment. The porous rock beds used in common biofilters must be inspected, removed and cleaned regularly to maintain peak air flow. Clogged rocks limit air flow and increase stress on the system’s ventilation. Removal and cleaning processes often become expensive ordeals. The porous rock tends to solidify in the biofilter due to demineralization. Before it can be removed and cleaned, the rock must be manually broken up into small pieces. This tedious process can easily lead to damaging the biofilter container. Those drawbacks cause some problems. The constant replenishment, replacement and maintenance that these systems require is costly, adding to their cost of ownership over time. Also, critical industrial processes must be stopped when biofilter maintenance occurs. These can combine to hamstring industrial facilities by causing production downtime or forcing the facility to purchase redundant equipment so odor control isn’t interrupted. Biotrickling filters are relative newcomers on the industrial pollution and odor control scene, but in their short history they’ve proved themselves far more efficient and cost effective than common biofilters. Instead of sending air through rocks and organic matter in a large pit in the ground, biotrickling filters collect foul air and force it up through a vessel filled with specially-designed synthetic media that harbors microorganisms. Water is sprayed downward through the media as the foul air is forced upward. The biology within the media consumes the odorous compounds. The remnants of those compounds are rinsed away by the water and clean air is released into the atmosphere. Synthetic biotrickling filter media lasts much longer than biofilter media. In fact, it’s often guaranteed to last ten years or more. This allows facility personnel to focus on core competencies rather than deal with frequent biofilter media maintenance. Biotrickling filters are also much easier to maintain and operate at a fraction of the cost of common biofilters. The parameters affecting peak performance of these systems are easily controllable, so their overall efficiency is guaranteed. The compact design and synthetic media used in biotrickling filters allow them to outperform common biofilters in a much smaller space. BioAir often recommends the EcoFilter® biotrickling filter as part of its BioAir Complete® emission control program. In short, biotrickling filters are consistent and predictable, giving facility personnel peace of mind and allowing them to focus on what really matters. If you’re rethinking emission control for your site, contact us to set up a consultation. BioAir scientists have provided cutting-edge emission control solutions for industrial and municipal clients all over the world. Learn more about how we do it in our introductory guide to industrial odor control.